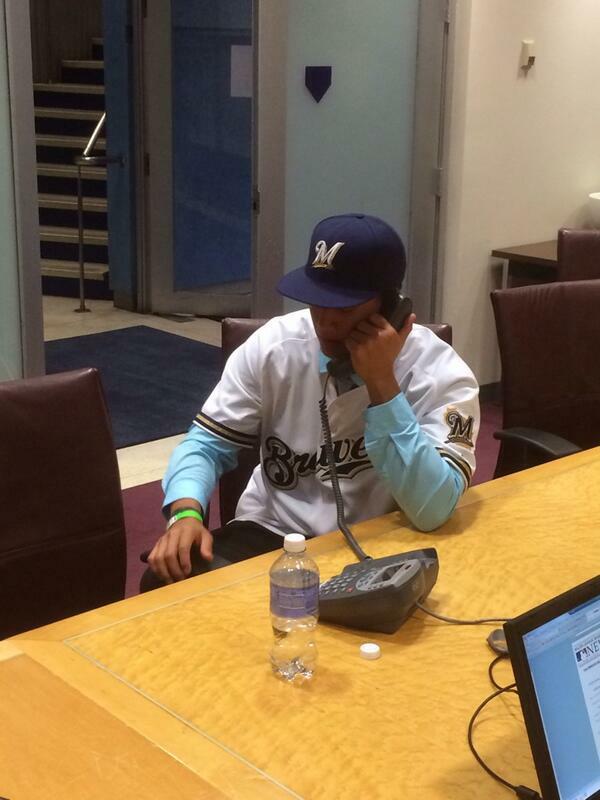 MILWAUKEE – The Milwaukee Brewers made three selections during day one of the 2016 First-Year Player Draft. The team selected outfielder Corey Ray (University of Louisville), third baseman Lucas Erceg (Menlo College) and catcher Mario Feliciano (Carlos Beltran Baseball Academy) with the fifth, 46th and 75th picks, respectively. The announcements were made by Vice President of Amateur Scouting/Special Assistant to the General Manager Ray Montgomery. Ray, a junior at the University of Louisville, batted .319 with 55 runs, 16 doubles, a triple, 15 home runs, 60 RBI, 44 stolen bases, a .396 OBP and a .562 slugging percentage this season. He was previously drafted by the Seattle Mariners in the 33rd round of the 2013 First-Year Player Draft out of Simeon Career Academy, but chose to enroll in college instead. The left-handed hitter is majoring in exercise science. He was scouted by area scout Jeff Simpson and regional supervisor Tim McIlvaine. Erceg, 21, is a junior at Menlo College. He hit .308 (70-for-227) with 47 runs, 15 doubles, 20 home runs, 56 RBI with a .351 on-base percentage and a .639 slugging percentage in 56 games this season. He was scouted by area scout Joe Graham and regional supervisor Corey Rodriguez. Feliciano, 17, is a senior at the Carlos Beltran Baseball Academy. He was a 2016 Rawlings-Perfect Game 2nd Team All-American and was scouted by area scout Charlie Sullivan and national supervisor Doug Reynolds. The Draft will resume tomorrow at 12 p.m. CT with rounds 3-10. 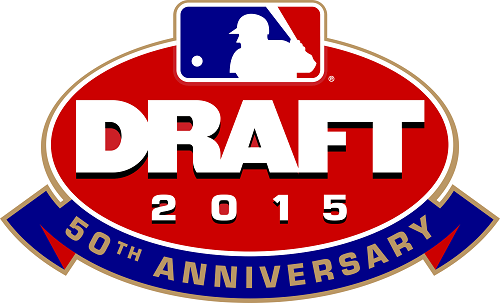 Day three of the Draft will begin at 11 a.m. CT on Saturday with rounds 11-40. The Milwaukee Brewers made eight selections during the second day of the 2014 First-Year Player Draft from rounds 3-10 this afternoon. Milwaukee selected four right-handed pitchers, two outfielders, one infielder and one catcher today. The Brewers drafted RHP Cy Sneed From Dallas Baptist University with their third-round selection (85th overall). He went 8-3 with a 3.55 ERA in 16 starts (104ip, 41er) during his junior season. Sneed, the 2011 Gatorade Player of the Year for the state of Idaho, was drafted out of high school by the Rangers in the 34th round of the 2011 draft, but chose to attend Dallas Baptist University. His older brother, Zeb, is a pitcher in the Kansas City Royals organization. Milwaukee selected CF Troy Stokes, Jr. from Calvert Hall College (MD) High School in the fourth round (116th overall). The speedy outfielder has a commitment to the University of Maryland. 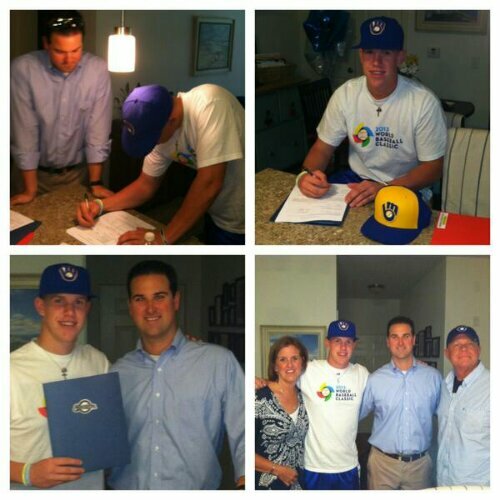 In the fifth round, the Brewers chose 3B Dustin DeMuth from Indiana University. DeMuth led the Hoosiers with a .374 batting average (79-for-211) and added five home runs and 40 RBI in 57 games during his senior season. As a junior, he was named a First Team All-Big Ten selection. Demuth was previously drafted by the Twins in the eighth round of the 2013 draft, but did not sign. RHP David Burkhalter was the last high school player taken by the Brewers on Day Two (6th round, 176th overall). The high school senior finished the year 7-3 with a 0.70 ERA this season and gave up seven earned runs in 70 innings pitched and recorded 104 strikeouts. A redshirt junior at Kansas State University, RF Mitchell Meyer was selected in the 7th round (206th overall) by the Brewers. He hit .264 (39-for-148) with eight doubles, one triple, three homes and 26 RBI in 51 games for the Wildcats this season. The Brewers used their 8th and 10th round selections to select a pair of college right-handed pitchers. Jeffrey (J.B.) Kole was selected 236th overall and finished his 2014 campaign strong for Villanova, finishing 3-0 and allowing just three earned runs over his final 21.1 innings pitched this season. Javier Salas, a senior from the University of Miami, was selected with the 296thoverall selection today. Salas went 4-3 with a 2.92 ERA in 52.1 innings. On March 4, against Kole’s Villanova Wildcats, Salas tossed the second perfect game in Hurricanes history. The only catcher selected by the Brewers today was Greg McCall from the University of Texas-Arlington (9th round/266th overall). A junior, McCall hit .238 (51-for-214) with 11 home runs and 48 RBI for the Mavericks. Overall, the Brewers have made 11 selections over the first two days of the draft, which includes six college players and five high school players. Milwaukee has selected five pitchers (one left-handers and four right-handers), two infielders, three outfielders and one catcher. MLB.com profile: The younger brother of Royals right-handed pitching prospect Zeb Sneed, Cy could have preceded him in pro ball, but he declined to sign with the Rangers as a 35th-round pick out of an Idaho high school in 2011. He instead headed to Dallas Baptist, where he has been a rotation mainstay since the first weekend of his college career. Like his brother, Sneed relies mainly on his arm strength. He maintains a 90-92 mph fastball deep into games and is capable of reaching 95, though his heater is a bit straight. For now, the rest of Sneed’s arsenal is ordinary. He has some feel for using a three-pitch mix, though neither his curveball nor his changeup is a consistently average pitch. He throws a decent amount of strikes, but his command isn’t terribly reliable, so he could wind up as a reliever down the road. MLB.com profile: Stokes may not have a true plus tool but he lacks any real weakness in his game with all of his tools having the chance to be average or better. Stokes’ best tool is his speed which will allow him to have solid range in center and steal a good amount of bases in pro ball. At the plate, he has shown a very advanced approach along with great discipline and many feel that he has a chance to be an above-average hitter in the future. He also has shown more power and harder contact lately, but at this point, it is more double power than home run pop. MLB.com profile: The Indiana senior has had a great spring, and his bat is most likely what will get him drafted. At the plate, DeMuth has a smooth swing and decent bat speed, and he has always shown the ability to hit for a high average. He also has good power to the gaps, but some wonder if he will have enough power to profile at a corner. Defensively, DeMuth has a strong arm and good actions at third, and he should be able to stick there long term. A team that wants an advanced, fast-moving college hitter could overlook his lack of homer power and take him as a senior sign. The deadline for players taken in the 2013 First-Year Player Draft is today at 4:00pm CDT. A couple of those unsigned picks have publicly indicated that they will not sign (including one such choice who declared his intention before the draft ever began back in June) so they come as no surprise. Probably the only player left in true limbo from what I’ve seen is 16th rounder Corey Miller, a RHP from Pepperdine University. The Brewers could offer him more than their remaining budget but there are penalties associated with that kind of thing. Assuming no one else signs, the Brewers will have added 18 pitchers (13 RHP, five LHP), two catchers, three first basemen, two shortstops, and six outfielders. No official second or third basemen in the bunch but players switch positions often enough that it wouldn’t be so odd to see one or more of those out of this group at some point. Time will tell soon if anybody else gets added to the roster out of the draft group, but between the 31 signees and several undrafted free agents, the Brewers feel as though they have added some quality gentlemen with a chance to contribute down the road.